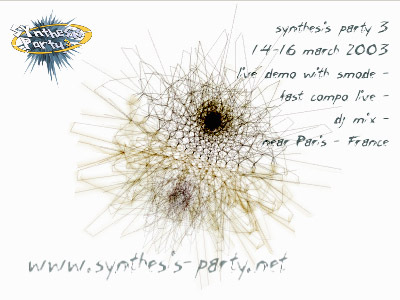 a mini-invitation for the synthesis party 3. Wow, come to synthesis party 3, It will be great. As it's first epidemic party we are part of responsible for, we take it seriously. Yeaaahhhh another strike by Jb^pipidemic francis^smousse. Just come to synthesis party 3 to see these people doing it live !!!! Very nice effects, even though I'm somewhat tired of the "OpenGL blue". Wasn't too short. effects are so cool. yes, it's very short, but should the invitation be that longer...? I like the Epidemic style. Good effect, too bad there's only one..
Hmm,. are there more parts than this weird wireframe object? I haven't noticed and pressed Escape..
Only one effect, but it's a sweetie! come to the synthesis party !!! page created in 0.018492 seconds with 15 queries.